Who IS True Kiss Destination? I obtained this wonderful album from my good friend Troy "Yen" Gonzalez, recording engineer at True Kiss Disc, Honolulu. He participated in the recording of tracks 1, 2, 5, 7, 9, 10, 11, 12, 13, 14 and 16. 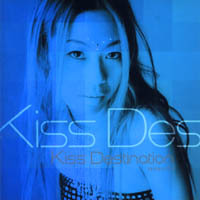 This CD is TKD's second album, whereas the first was a Limited CD Album entitled "TRUE KiSS DESTiNATiON", catalog number TRUEKC 101. This is simply one of TK's 'intro' sequences, opening with the sound of a ping-pong ball falling, and a short poem recited by Asami. TKD's fourth major single release, featuring the smooth sound mix of Pachelbel's Canon in D Major in the background. Reminds me of Evangelion! TKD's fifth major single release; This song is quite repetitious, but as all the other songs, smooth and interesting to listen to, with an awesome beat. TKD's first single major release, as well as the sixth analog single, being their rendition of the oldie song. The beat has been 'updated', so to speak, and the nice mix of Japanese-English dialogue is used quite frequently here. TKD's third and fourth analog singles. This song almost sounds like something Namie Amuro or GLOBE would do, indicating it's particularly 'unique' and continuing usage of beats. TKD's second major single, as well as seventh analog single. Whoever has sampled this song agrees with me that it is definitely one of the best tracks of this album! The beat is great, and Tetsuya's short raps coincide perfectly with Asami's singing. This song reminds me of TLC's later sounds, although the title of the exact song escapes me at the moment. This has a quaint R&B feel to it, as well as several word/piece excerpts from "Silent Night" and "Joy To the World" mixed into the song. TKD's fifth analog single. This song is pretty repetitious in itself, but Asami's rap sessions are definitely cool. The beat is a bit bland, but Asami sure makes up for it. Nothing different than my comments for track 8, however this song is a bit more amusing. The beat is great though; I can now see why it was used in DDR. I really 'dig' this song. All of the elements of the song compliment eachother perfectly; The wide array of instruments such as guitar, mixers, piano and such work together really well, despite what one may think. TKD's first and second analog singles, rendered from the classic love song. Of course, this version is a Japanese-English mix of dialogue, as was 'Africa'. I like the variation of style on this album, and this is a pure reason why. TKD's third major single, as well as eighth analog single. This is a good song. One of the more upbeat, yet mellow, songs. Again, almost a beat that GLOBE would feature. This is probably my second favorite songs, if not first, of the album. TK supplies the smooth sounds on his piano, with the help of some other beats and instruments. I could totally imagine Asami in a 'bar-club' type scene if this was made into a music video - - The flow of the song is so relaxing! I like this version a tad more than the other (track 14), as it only consists of TK's piano works and Asami's soft humming to the beat of 'Sugar Baby Love'. These two really make a great team. Two songs of which are also featured in DDR and performed by TKD but are NOT featured on this album are "Hello Again" and "Pure Mind", which are probably earlier or newer works of the group (most likely the latter). Should you get this CD? If you like various beats with a jazzy and game-like dance mix to it, definitely! If you're also a fan of DDR, it is a total must! Trust me : You will not be disappointed with this album! I must also make note that Asami Yoshida has one of the most crisp and clear Japanese-Pop voices I've heard, which really makes her stand out compared to other female J-Pop artists out there. For the curious, there is a short sample MP3 available of three songs on this album from myself and mixed by Kaneda-kun. This sample consists of songs 'How Do You Think', 'Responsibility' and 'Long & Winding Road'. If you haven't already, check out my review on Namie Amuro's "Genius 2000" album also in this issue of AF. That's all the time for me this month -- Catch you later! Want to hear a sample of Kiss Destination - Gravity? Sells for ¥3,059 / ¥2,913 conversion. First Press Limited Edition Copy comes with a Prism Sheet Box.